When it comes to the in vitro cultivation of demanding animal cells, simulating real physiological conditions in CO2 incubators is particularly challenging for the technology used. This is even more evident when researching human or mammalian cell cultures. This article explains why the oxygen concentration in particular plays a key role in cell growth. The in vitro cultivation of demanding mammalian cell cultures in CO2 incubators is extremely challenging for the lab technology used. The aim is usually to simulate the real physiological conditions. These are primarily provided by the culture medium and the vessel, but the incubator also controls four key factors: the temperature, the CO2 concentration, the osmolarity, and also the oxygen partial pressure. If you simulate the human organism as a “working environment”, then the correct oxygen supply plays a key role in the response of the cells. Quicker cell proliferation is usually a good indicator of this. When the oxygen supply is normal in a healthy human being, we call this normoxia. This describes the physiological O2 partial pressure in the cell tissue. Research findings from recent years show that the oxygen concentration varies widely in the different types of cell in the human body and is often under 21 percent, which is typical in the laboratory (normoxia). Fatty tissue, for example, has an oxygen concentration of around 10 to 15 percent, whereas in the bone marrow, this is approximately 6 to 7 percent. Lots of types of cell therefore grow best with a reduced oxygen concentration. The lower oxygen concentration provides a better simulation of the physiological conditions. We call refer to an oxygen concentration below the standard value (normoxia) as hypoxia. 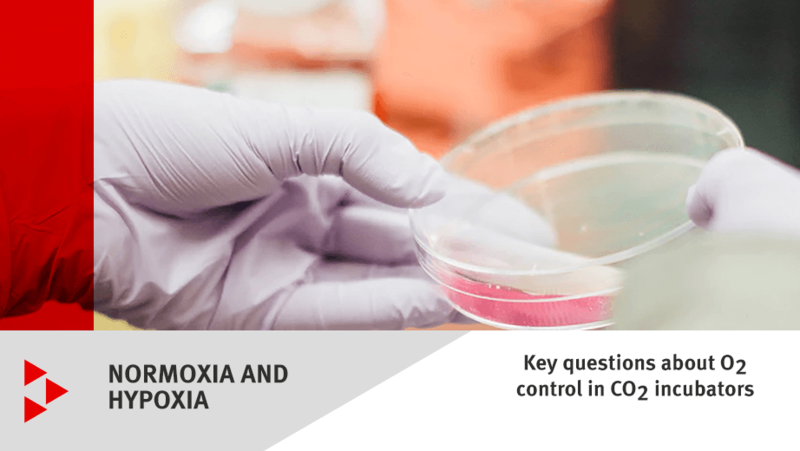 For the in vitro cultivation of cell cultures in CO2 incubators, the term hypoxia does not refer to research on the disorder “hypoxia” (or it only refers to this in exceptional cases). Instead, it means cell cultivation under conditions with a reduced amount of oxygen. The area of application is extremely broad and stem cell research is a prime example. Hypoxic conditions are also ideal for researching primary cell cultures and embryo cultures. CO2 incubators used for purposes like this must have an oxygen supply which can be adjusted at will. In addition to hypoxia, this also makes it possible to simulate hyperoxic conditions (21 to 90%), which are ideal for researching sensitive tissue, such as the lung or retina. Hypoxic conditions are just one of the things set out in “Good Laboratory Practice” (GLP). Use our checklist to find out what you need to take into account for GLP-compliant research. Get your free download here. Reducing the oxygen content to a certain constant level in a controlled manner is a complex process and needs to be repeated every time the chamber is opened. CO2 incubators which can master this task are rare. Every time you open the test chamber, this is a risk that the pH of the medium will increase, which will cause alkalosis of the cell cultures. This occurs as a result of the sharp drop in the CO2 concentration. Good incubators therefore guarantee quick CO2 recovery times. The BINDER CB CO2 incubator series provides excellent growth conditions for cell and tissue cultures, precise control of oxygen concentrations down to 0.2 vol% and a program-controlled hot air 180°C decontamination cycle. The BINDER CB series is the premium range for all sensitive incubation tasks. Even during complex cultivation experiments or individual environments under hypoxic conditions, it is easy to grow thanks to suitable variants and a comprehensive assortment of options and accessories. You can learn more facts and figures about the CB series here. Basic research on hypoxia sensing, signaling and adaptation requires stabile and reproducible O2 levels, quick recovery times, and cost-efficient gas consumption. Read our Buyer's Guide on CO2 incubators to learn about the factors that need to be considered when buying a CO2 incubator.